All about the author of this web site. I was born in Bethnal Green, East London and lived there for most of my life until moving to East Ham (also in East London) in 1999. In 2003, I relocated to Macclesfield on the eastern side of Cheshire, with my wife Pauline, who is from Manchester. Click each thumbnail to view an enlarged image. Iain - The Scots Gaelic form of John, which itself translates from Hebrew as "God is Gracious". Emberson - This literally means "Son of Emery" and Emery is a Germanic word meaning "Work Rule". The Emberson family motto is fides et suavis, which translates as "Faithful and Graceful". On researching my ancestors, I found that many of them lived in Lincolnshire and Cambridgeshire, and eventually Essex and London. Today the Emberson family name is commonest in the South East of England. My wife's maiden name is Waring, which seems to be of Germanic origin and is connected with the verb "shelter or protect". I have drawn up a list with selection of common Christian names and their meanings called What's in a name ? Personal Ambition Outside Work To complete a theology degree and be a good catechist/teacher of the faith - please God. The Macclesfield Canal and Betws-Y-Coed, North Wales. I am no Keats or Shelley, but I enjoy expressing myself in Poetry. Words are powerful means of communicating ideas and provide me with a way of reflecting on life's up's and downs. I have written a mixture of poems, some romantic, some religious and some just musing over life itself. Please do have a look ! I have visited a few countries abroad and regard my favourite country as the United States. I had the pleasure of touring there by car in 1998, covering 4,000 miles in about 10 days and crossing the country from East to West. More details of my trip can be found on the USA trip page. As a keen runner, I ran in the London Marathon on three occasions and somehow (!) finished every time. The London Marathon was first run in 1981 and is one of the world's most popular running events. Regularly attracting over 25,000 runners, the course is flat and fast. It begins on Blackheath in South London and ends in the Mall near Buckingham Palace. My own experience of the Marathon was very satisfying, not least because of the tremendous encouragement given by the spectators along the way. Apart from the London event, we also have the Great North Run which attracts over 30,000 runners and is held each year in Tyneside. Living as I do near the Macclesfield canal, I also have the opportunity for plenty of walks by the canal bank. Ever wondered what you area looked like in the 1800's ? or 1900's ? I find the whole subject interesting, not least as it forms part of local history. Try old maps online to find out more. Along with other members of my family, I am an cat lover. I have set up a memorial site called A Cheshire Cat for my cat Monty who sadly passed away in 2012. We adopted a rescue cat called Angel (Tortoiseshell) from the RSPCA in 2012 and also acquired a Cavalier King Charles Spaniel in 2013 and named her Cindy. Sadly, Cindy passed away in September 2014. My Christian faith is the centre of my life and I came to faith through the Godly influence of my Mother. "Do you not know that in a race all the runners run, but only one gets the prize? Run in such a way as to get the prize. Everyone who competes in the games goes into strict training. They do it to get a crown that will not last; but we do it to get a crown that will last for ever. Therefore I do not run like a man running aimlessly; I do not fight like a man beating the air. No, I beat my body and make it my slave so that after I have preached to others, I myself will not be disqualified for the prize." I mentioned earlier that I live in Macclesfield, and here provide a brief introduction to the town. Macclesfield is a busy town (population c. 50,000), part of the county of Cheshire and located in the North West of England. Macclesfield lies on the River Bollin and is about 15 miles south of Manchester and 200 miles north of London. It is also close to the scenic Peak District. The town has good access to the motorway network (M6, M56 and M60). From the 18th century onwards, Macclesfield became synonymous with the silk industry and working mills still exist. Also Hovis bread (from the Latin "HOminiS VItae" - the strength of man) has its origin here. Macclesfield has many churches, and pictures of some of them may be found in the Churches Photo Album. 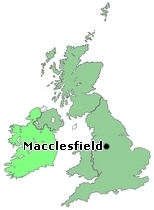 An online map of Macclesfield and the surrounding area can be found at the Multimap web site. The sign as you leave Langley Methodist Church.